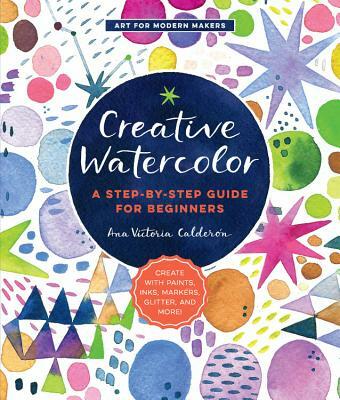 Creative Watercolor offers beginners a fun, modern, and practical approach to a timeless medium with instructions on how to paint simple motifs and lettering and embellish projects beautifully. Use what you've learned to create unique, stylish stationery, including beautiful invitations, place cards, menus, monograms, recipe gift cards, thank you notes—any project you can imagine, for any kind of event you can think of! There's never been a better time to dive into the world of watercolor, so why wait? Grab a brush and get painting! Perfect for creative beginners, the books in the Art for Modern Makers series take a fun, practical approach to learning about and working with paints and other art mediums to create beautiful DIY projects and crafts. The author of Creative Watercolor (Quarry Books, 2018), Ana Victoria Calderon is a Mexican/American watercolor artist and teacher with a bachelor's degree in Information Design and continued studies in Fine Arts. Her licensed artwork can be seen in retail outlets throughout the United States and Europe, on a wide variety of products, and she also sells prints of her artwork on Etsy. Ana teaches in-person workshops and hosts creative retreats in Tulum, Mexico, as well as more than 50,000 students on Skillshare, where she is a Top Teacher. See more of Ana's work on Instagram (@anavictoriana), YouTube (Ana Victoria Calderon), and Facebook (Ana Victoria Calderon Illustration). She lives in Mexico City, Mexico.